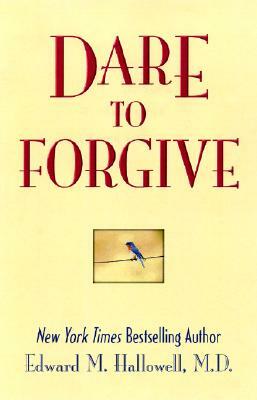 By Edward M. Hallowell M. D.
Forgiveness is not a sign of weakness but of strength. It's also healthy, brave, contagious--and it sets you free. Everyone needs to forgive, whether it's your parents, your neighbors, your dog, the man who cut you off in the traffic this morning or the criminal who murdered your loved one. In this clear, concise and inspiring book, bestselling psychiatrist Dr. Edward Hallowell shows you how. In his typical lively and engaging stle, bestselling author Dr. Edward Hallowell leads you through a series of definitions and situations to an understanding of the true nature of forgiveness. He shows how and why forgiveness is the basis of a happy and healthy life, and then gives you a practical four-step program to create more of it in your own life. Maybe you're letting the small insults of daily life pile up and cause you stress. Dr. Hallowell will show you how his own frustration over a Porsche stealing his parking spot on a busy street led him to do something reckless. Maybe you're hurt by the thoughtless actions of those you love. Dr. Hallowell shows how a lack of forgiveness has stunted a marriage and how it has torn a family apart--even after all the family members have long forgotten what they disagreed about. Maybe you're feeling let down by your own thoughts or deeds. Dr. Hallowell shows how finally forgiving himself transformed an accidental killer into a productive member of society. Or maybe something truly terrible has happened that, over the years, has eaten a hole in your soul. Maybe you're one of the people who think they can never forgive. . .
"This might be the most important book you will read this year. The absence of forgiveness in our lives cripples us and it is crippling our society. Ned Hallowell does not gloss over how hard it is to forgive. Yet through his deep insight, practical steps and rich stories, he invites the reader into the sweetness of forgiveness. This is a graced achievement "
"Why forgive? And how do we go about it? Dr. Hallowell addresses this age-old question with tremendous wisdom and heart. He is a compelling and generous storyteller, and he provides the reader with not only tools, but also a larger sense of hope and possibility." "Ned Hallowell is a healing writer. He possesses the most inspiring and optimistic voice emerging from the medical community today... Dr. Hallowell brings his scientific knowledge and his generous heart to bear on the problems that afflict our lives and those of our children, and we are better for his unique vision."